August 16th. Our wedding anniversary. What better way to spend it than taking The Children to a theme park?! Luckily they're not really into the big scary rides yet; the ones they can cope with, I can manage to accompany them on! The Doctor bravely volunteered to look after the bags and the camera.... Here you see me and The Children getting completely soaked on the log flume! I love log flume rides. I love calzones too, stuffed with pepperoni & sausage & cheese. Most pizza places sell them along with stromboli, which are the same thing but with different cheese. Amazing how many cultures wrap food up in dough to go. 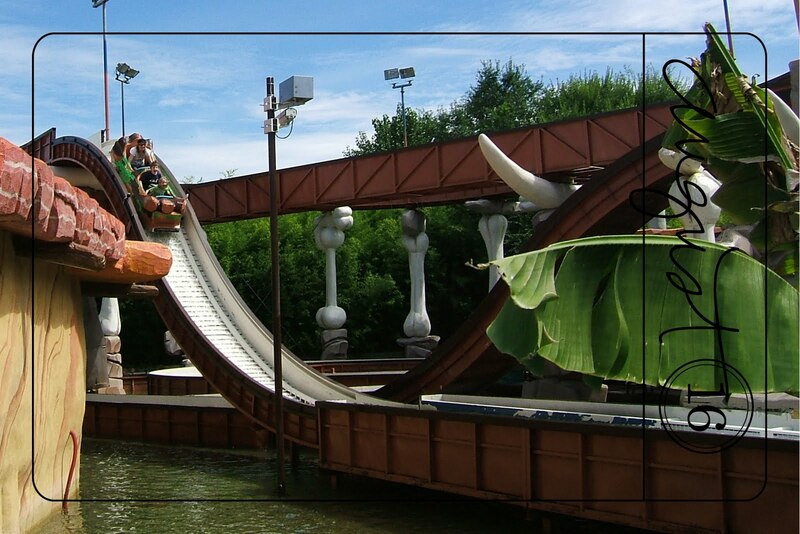 Yay, I love log flumes! I also love Calzone - a local restaurant makes them with meatballs in - they are fab!